Ecuador is one of the world’s most biodiverse countries: in this small but breathtakingly varied nation, you can visit tropical beaches, volcanoes, cloud forest and jungle all on the same day. Ecuador is also steeped in culture, with colonial Spanish churches, pre-Columbine archaeology, and bustling indigenous markets. 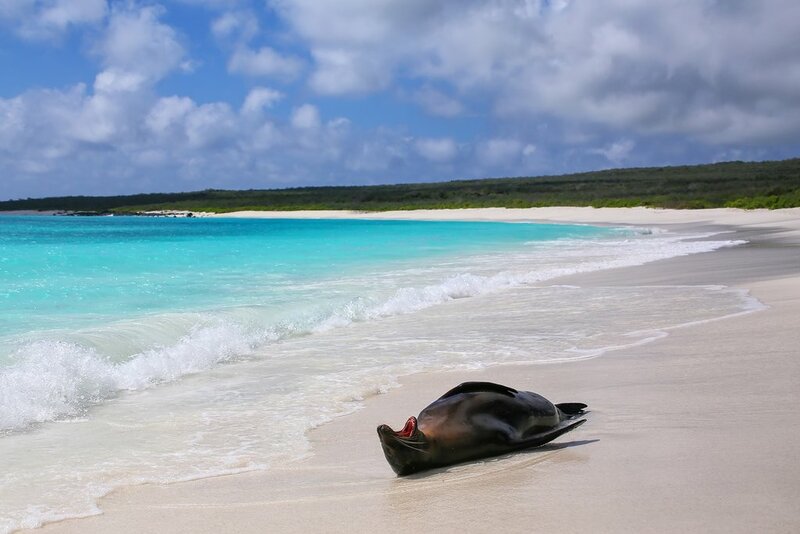 The icing on the cake is the incredible Galapagos archipelago which belongs to Ecuador. From the Andes to Amazon, here are our main highlights. Quito, the world's second highest capital, offers excellent cultural pursuits and impressive architecture. 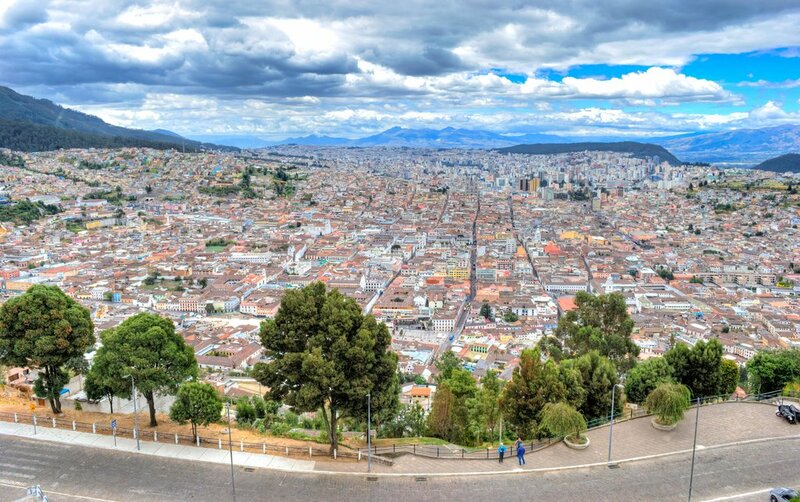 Ecuador’s capital is the second highest in the world with a spectacular setting in the shadow of Pichincha volcano. 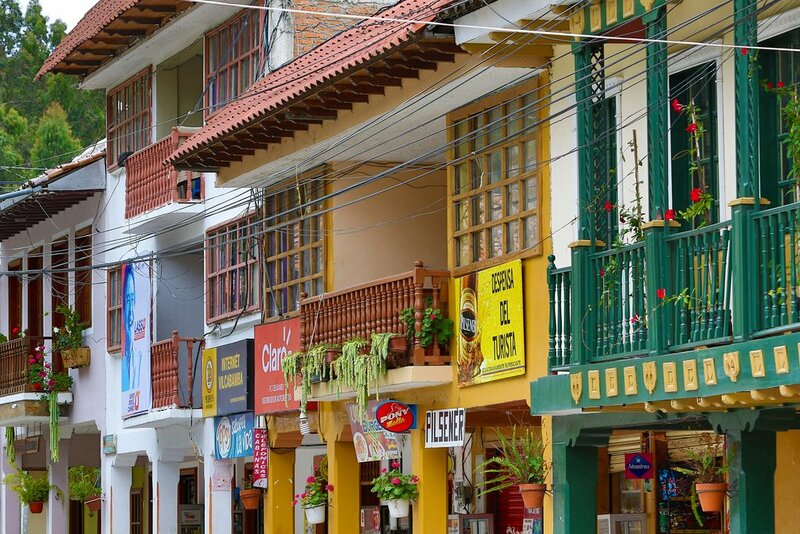 The Old Town has impressive colonial architecture, so don’t miss the tours of the Presidential Palace, the golden grandeur of La Compañia Church, and the Virgin of Quito south of the center. The New Town is a busy hub for travelers and has many highlights, notably the incredible archaeology of Museo Banco Central and artist Guayasamin’s greatest work: Capilla del Hombre (the Chapel of Man). No trip to Quito is complete without visiting the Equator, located a 30-minute drive to the north at Mitad del Mundo. 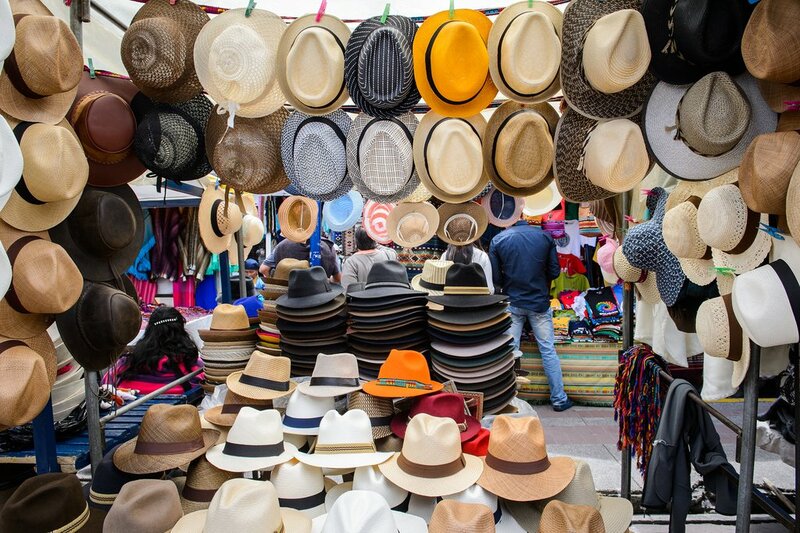 Hats for sale in the Otavalo Market, the largest indigenous market in Latin America. In the northern highlands, this small town hosts one of the biggest indigenous markets in Latin America. The market is permanently on Plaza de Ponchos but extends throughout the center of town on Saturdays. The textiles are most famous and you'll find everything from alpaca wool sweaters to ponchos, carpets, blankets, hats, and handbags. Otavalo has a spectacular location between two dormant volcanoes, Cotacachi and Imbabura and when exploring the surroundings, don’t miss Lake Cuicocha and Mojanda Lakes. 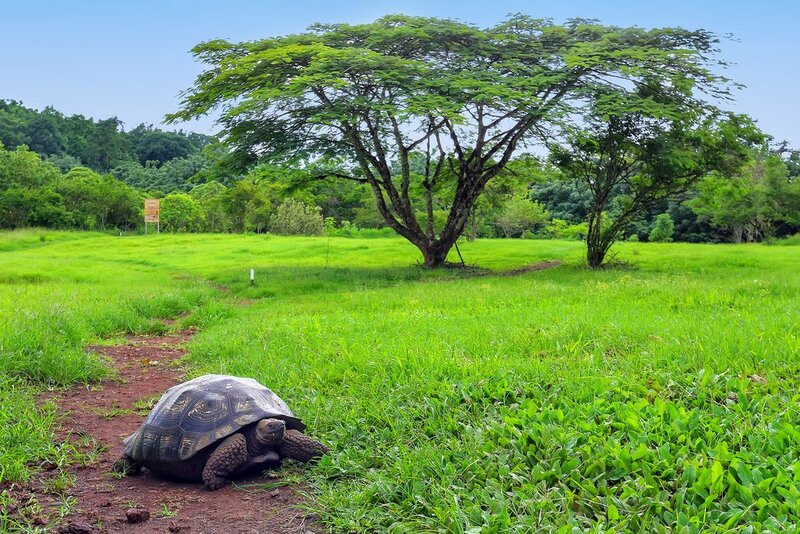 Amazing wildlife, including giant tortoises, can be spotted on the Galapagos Islands. Some 600 miles off the coast, these islands are arguably the most fascinating, far-flung part of Ecuador. A visit to this enchanting archipelago is on many people’s bucket lists, and nowhere else on Earth can you get so close to wildlife that has so little fear of humans. On land, take in the islands’ incredible geology and be amazed by plodding giant tortoises, sunbathing iguanas, and majestic albatrosses coming into land. Then decide which bird’s mating ritual is more entertaining — the blue-footed booby marching around showing off his bright blue feet or the magnificent frigatebird inflating his red chest to the size of a basketball. The waters off the Galapagos are even more spectacular: Diving with hammerhead sharks and other sea creatures is a highlight of this truly astonishing destination. 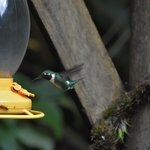 Ecuador has more species of birds than all of North America and this little town in the cloud forest is one of the prime locations for birdwatchers. 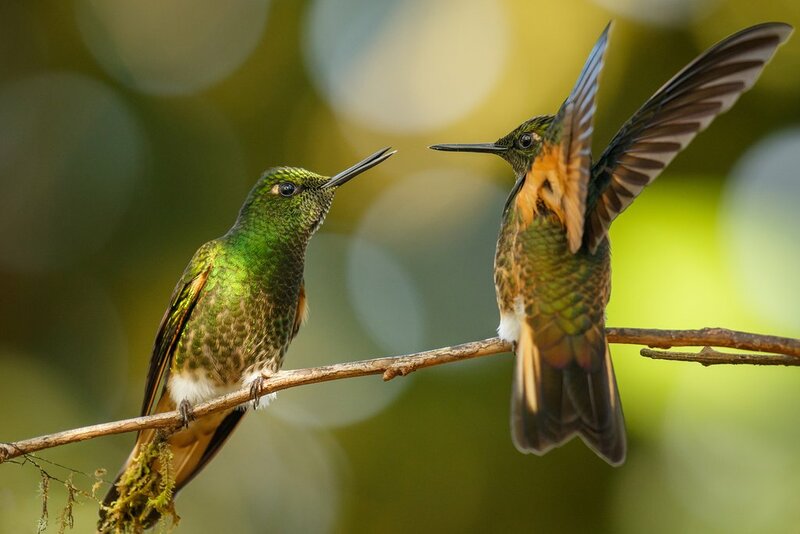 In a tranquil valley at an ideal elevation of around 4000 ft (1219 m) above sea level, the surrounding forest teems with toucans, quetzals, and hummingbirds, as well as butterflies and diverse flora and fauna. Hikes and guided birdwatching tours in the cloud forest are highly recommended, but for something more action-packed, you can go zip-lining across the forest canopy or ‘tubing’ down the river rapids. Cotopaxi is a prime destination for hikers and climbers. Driving south of Quito through the 'Avenue of the Volcanoes' is spectacular, and the main attraction is Cotopaxi, at 19,347 ft (5,897 m) the highest active volcano in the world. 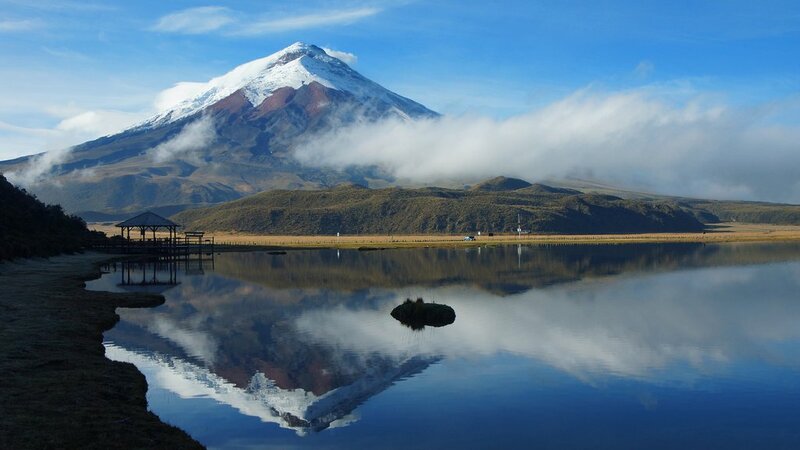 The snow-capped cone looks like a picture-perfect volcano, dominating Ecuador's most popular mainland national park. Over 33,000 hectares of high Andean grasslands host deer, rabbits and over 90 species of birds including condors. The peak of Cotopaxi itself is a fantastic but arduous climb, requiring acclimatization and a high level of fitness. If you wish to climb it, you should spend a few days trekking at elevations up to 13,000 ft before spending a night at the refuge at 15,748 ft (4,800 m) and setting off for the summit at 1 am. The views over the surrounding Andes and valleys are completely awe-inspiring. 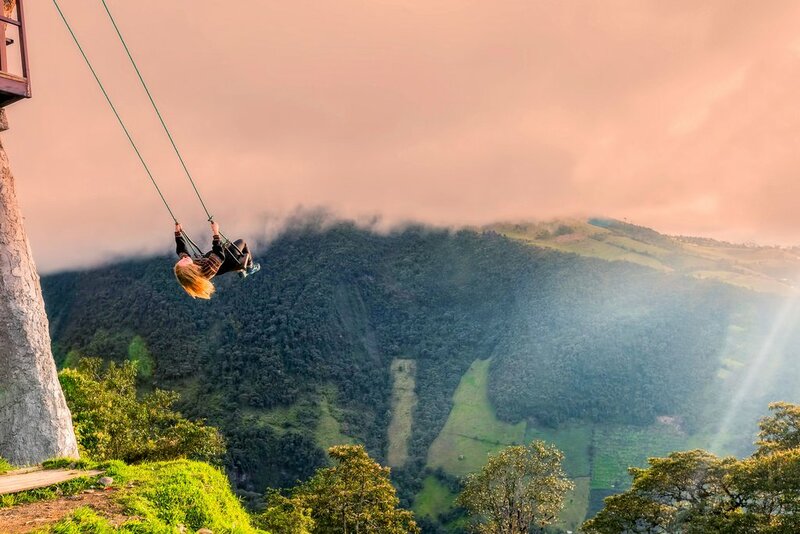 The Swing at the End of the World, outside of Baños, makes for a unique and fun day trip. This tiny town lies just a few miles from one of Ecuador’s most active volcanoes, Tungurahua. Luckily though, Baños lies on the opposite side from the crater of the ‘throat of fire’, and takes its name from the thermal springs that draw tourists here. A soak in the yellow, mineral-rich baths is a must and you can also explore the surrounding countryside in the Pastaza Valley, dropping down towards the jungle. Bike rides, waterfall tours, rafting, and zip-lining are just a few of the activities to enjoy here before a long soak at the end of the day. One unique activity just outside town is a hike to Casa del Arbol and the "Swing at the End of the World", which flings its passenger back and forth over the edge of a valley. 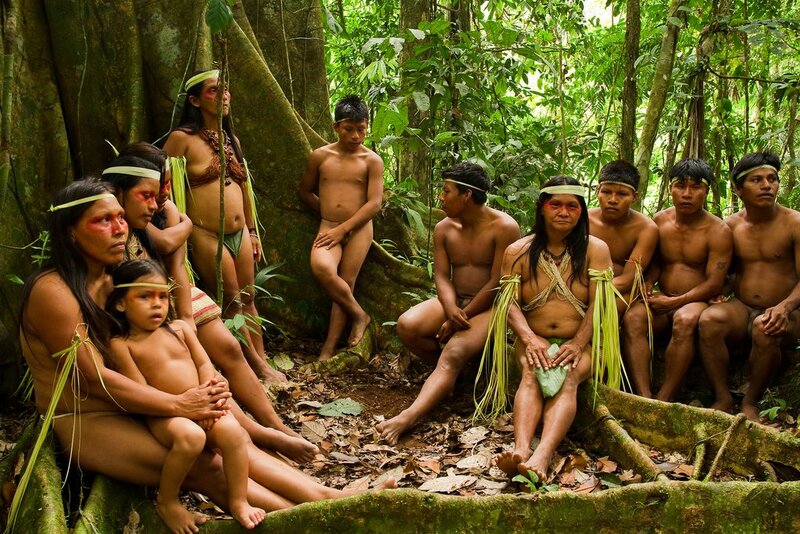 Members of the Huaorani tribe, in Yasuní National Park. Nearly half of Ecuador’s land mass lies in the Amazon basin and tributaries such as Rio Napo flow into the Amazon river over the border in Peru and Brazil. A trip to primary jungle is an unforgettable experience and many of the best lodges are close to Yasuní National Park. Canoe rides along tributaries, bird-watching from 50-meter-high towers and hikes to clay licks teeming with parakeets are just a few of the highlights. Creepy night walks to tarantula holes and night excursions to spot caiman will exhilarate you, while a blowgun shooting class with a local tribe is good fun. You may be lucky enough to spot pink dolphins, but jaguars and anaconda remain largely (and thankfully) elusive. Vilcabamba, well-known as a magnet for backpackers, is a great base for hikes and horse rides. This small town in the southern Andean foothills has become a magnet for backpackers and retired folk seeking relaxed surroundings. The area has been known as the ‘Valley of Longevity’ ever since the remarkably healthy local elderly population was featured in Reader's Digest in the 1950s. While time has moved on, Vilcabamba remains an attractive base for relaxing with healthy organic food and sampling a massage and other pampering therapies. There are lots of gentle hikes near to town, or for something more adventurous you can try horse-riding or trekking in nearby Podocarpus National Park. 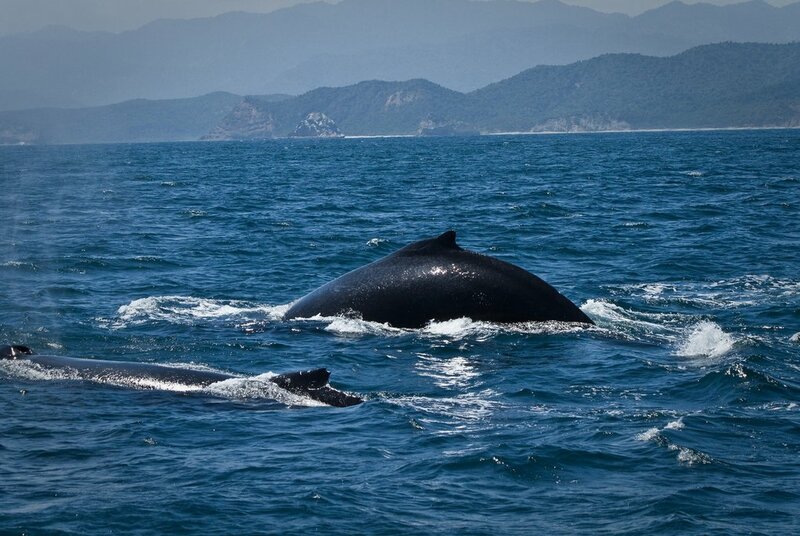 Humpback whales can be spotted off the coast at Machalilla. Ecuador’s coastline is mainly known for its beaches and surfing, and resorts such as Montañita, Canoa, Mompiche, Atacames are all popular. 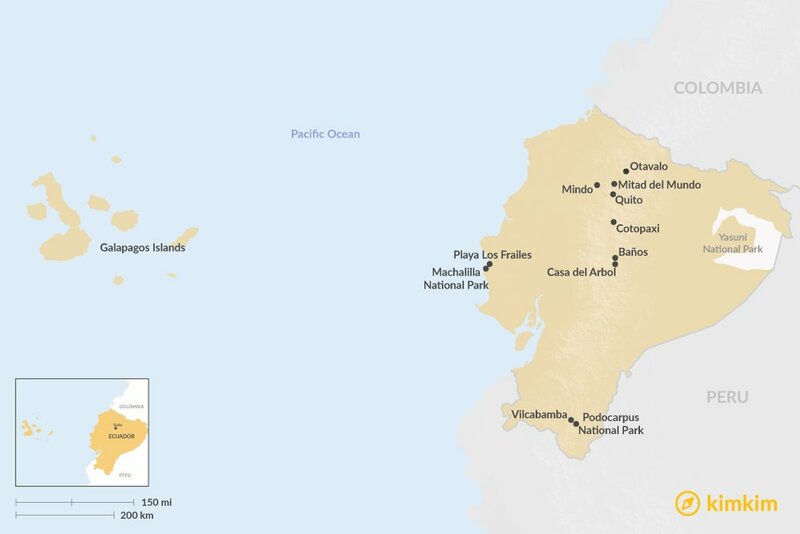 However, the most beautiful part of the coastline is the protected zone of Machalilla. Here you’ll find one of the country’s most beautiful pristine beaches, Playa Los Frailes, and from June to September there is a spectacular whale-watching off the coast. Don’t miss a trip to Isla de la Plata, which has populations of blue-footed boobies and other birdlife, as well as a small colony of sea lions.